The defense of the Kurdish city of Kobani against the so-called Islamic State (IS) drew worldwide attention. In the middle of the Syrian civil war, the Kurdish movement is attempting an experiment in democracy and self-rule in three areas in the north of the country, together called Rojava. The leading political force in this experiment is the PYD (Democratic Union Party). 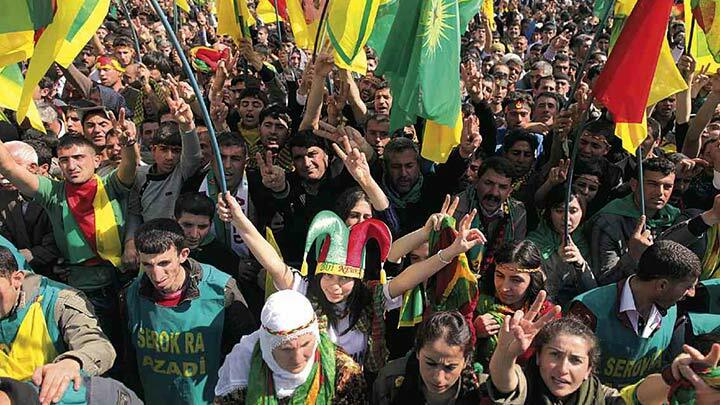 The PYD and its sister organizations in Turkey (PKK) and Iran (PJAK) fight for autonomy for the Kurdish population. In these areas the movements claim to be building a society with equal rights for men and women, direct democracy and social justice. In the ‘social contract’ of Rojava, a kind of constitution, resources and land are declared to be common property, democratic freedoms, the right to free education and to a livelihood are recognized. It is a unique experience and a source of hope. At the same time, much remains unclear about local developments. While the PYD receives support from Western powers in its struggle against IS, her sister organization — the PKK — is still banned in Western countries as a ‘terrorist organization’. In Syria many people strongly criticize the PYD. What kind of movement is the PYD? And what are the developments in Rojava? In this interview, Joost Jongerden discusses these questions — and others. Jongerden teaches rural sociology at the University of Wageningen in the Netherlands and published several books and articles about Kurdistan and the Kurdish movement. Among other works, he wrote Radicalising Democracy: Power, Politics, People and the PKK and co-edited an issue of the European Journal of Turkish Studies on ‘Ideological Productions and Transformations: the Kurdistan Workers’ Party (PKK) and the Left‘. The interview was taken and translated from Dutch by Alex de Jong. Let’s start with the political evolution of the PYD. This movement bases itself on the same ideology as the PKK, an organization which started as a Marxist-Leninist national liberation movement. My impression is that since the mid-nineties, and especially since the arrest of PKK-leader Abdullah Öcalan in 1999, an ideological metamorphosis took place that led to placing direct democracy and autonomy at the center of the movement’s discourse. Let me begin by addressing the characterization of the PKK. This organization was officially founded as a party in 1978 but already from ’72, ’73 on there was a process of group formation that led to the birth of the PKK. So this group started to form shortly after the military coup in Turkey in 1971. This was a time when the radical left in Turkey was violently repressed, leaders and cadres of left-wing movements were sentenced to death or died during military operations, other activists were imprisoned. What followed was a period in which activists tried to rebuild the left and were looking for new orientation points. The people who would later form the PKK were already active during those years and were searching as well. At first, the separations between groups were fluid — there was a lot of internal discussion — but later on these groups evolved into clearly separate organizations. One important difference between the PKK and other groups that were formed during that time was that it remained independent from the existing political models. I want to soften the impression that the PKK was very ‘orthodox’. It was a Marxist-Leninist party, with the hierarchy and ideological reference points you would expect from such a party. As such it was not very different from most of the left at the time. But the difference was that the PKK saw none of what they called ‘really existing socialist’ countries as a guiding country — not China, not Cuba, not Albania nor the Soviet Union. These countries aspired to realize socialism, but none of them were considered to be suitable examples. This was an important difference between the PKK and many other left-wing parties at the time that viewed certain countries as the representation of their conception of socialism, as their model. What implications did this have for the PKK? The PKK had a more critical view of their ideology, they didn’t adopt an existing model but were able to interrogate themselves critically. They were more self-reliant ideologically. They always gave a lot of attention to self-evaluation and ideological education; after all they didn’t have a model or guiding state so they were forced to think more for themselves. The ideological metamorphosis of the PKK is related to this. In the mid-eighties the PKK formulated a criticism of the Soviet Union, which led to them being attacked by pro-Moscow parties. Nowadays, the PKK claims this period was the beginning of a process of ideological self-interrogation. If you analyze that critique today there is a risk of reading things into it, but I think you can say there is a relation between this critique and the later developments. The PKK observed that if you look at the countries where national liberation movements took power, and at the so-called ‘really existing socialist’ countries, that the reality there was very different from what had been the promises for which people fought. If you talk about this with PKK members today, they say it would be incorrect to claim the struggles of such movements brought no gains at all, but also that these results fell short of the promises. Questions about how this was possible were back then already related to a critique of the of the state and of the nation state. But what they say is that back then they had this critique but didn’t have an alternative. The paradigm shift in their thinking was a long-term process that was concluded somewhere in 2003-’05. Would it be correct to say that the process of questioning the Marxist-Leninist ideology goes back longer, but that only in the early 2000s answers were formulated? And this critique, was that one of the state as such or of certain, existing nation states? Both, actually. It is a critique of the nation state in the sense that it questions how in such a state a certain identity becomes the measure of the state and who has rights — excluding people who don’t fit this identity or pressuring them to assimilate to varying degrees. It is part of the essence of Turkish nationalism, of Kemalism, to assimilate people with a different cultural identity, and the Kurds formulated a fierce critique of such policies. In a way, that is self-explanatory — yet many national liberation movements criticized the state under which they lived but looked for a solution in creating a nation state of their own. The problem then returns as the solution! Inside the PKK, the criticism of the Turkish nation state led to questioning the desirability of a Kurdish nation state in which minorities might yet again be disadvantaged. The state as such is criticized by posing that it has penetrated into the micro-levels of social life and has supplanted people’s own capacities and potential for self-organization. We all relate to the state as separate individuals while forms of collectivity to a large degree have been dismantled; society is splintered. Instead of turning towards the state for a solution, people’s capacities for self-organization should be strengthened. But in many of the writings of Öcalan, who remains the ideological leader of the movement, he talks about an essential, unchanging Kurdish culture. And even if this is no longer related to the goal of a Kurdish nation state, it is questionable how much room this leaves for social pluralism, for groups that fall outside this category. All the more because, according to Öcalan, the politics of the PKK are supposedly to a large extent based on what he considers to be the essence of this Kurdish culture, which is its egalitarian and freedom-loving nature. I think Öcalan’s writings are ambiguous. One reads references to a certain conception of Kurdish history but at the same when the category of ‘Kurds’ is discussed, it is recognized that this is a diverse group — for example in the languages that are used, or in religious aspects. So if one would try to create a Kurdish nation state, what would be the national language? Those are the kind of questions the PKK poses and that lead to a lot of discussion in the Kurdish movement in general. But in the texts you hardly encounter an interrogation of the Kurdish identity. From roughly the turn of the century on it seems that some of the answers to questions the movement had been wrestling with were found in the work of Murray Bookchin, a libertarian socialist from the US. Why Bookchin? My impression is that this started with Öcalan who after his arrest started to read widely, encountered Bookchin and after him the rest of the organization followed. Is that about right? You have to consider that Öcalan defended himself in the Turkish state’s case against him. This gave him almost unlimited access to literature. There are lists of the books he has requested to read in prison and those are very extensive and varied. Bookchin is one of the authors on those lists but he is not prominent. Still, he was clearly an inspiration for Öcalan. Öcalan regularly speaks with his lawyers and those talks are recorded, edited and published by the PKK. At a certain moment during such a conversation, Öcalan recommended the members of municipal councils in southeast Turkey, in the Kurdish areas, to read Bookchin. Clearly, the theory spreads from Öcalan himself. At the same time, I think the PKK is collectively searching for new ideas, but in this process Öcalan is dominant. Still this role is not completely unchallenged, and in 2004 there was a split away from the PKK of people who disagreed with Öcalan’s new orientation. A few years earlier there was already a split after Öcalan’s statements in the Turkish court. A number of PKK militants back then stated that Öcalan had abandoned the goals of the movement, for example by asserting that the PKK no longer wanted to create a Kurdish state. These members wanted to stick to the old orientation. Öcalan’s courtroom statement came as a shock to many PKK members. But that would indicate that Öcalan himself, as an individual, determines this development. There seems to be contradiction in the PKK: this organization and its allies have developed into a movement claiming a kind of direct democracy as its goal, but at the same time this goal of democracy from below seems to be based on instructions from above, from Öcalan? Öcalan certainly plays a dominant role. Instructions might be putting it too strongly but we could certainly speak of motivation. But look for example at the anarchist movement in the Netherlands in the early twentieth century; in this movement Domela Nieuwenhuis was dominant and he clearly left his impression on it. At the same time, there were various forms of self-organization. There is a certain tension between these development, but such a prominent role of a certain individual doesn’t exclude the other. The PYD claims to have no organizational ties with the PKK but they have the same ideological inspiration and develop in similar ways. The two share a common goal. That goal goes by different names. In his early statement for the court, Öcalan speaks of a ‘democratic republic’; today the emphasis is on something called ‘democratic autonomy’ and both are covered by a third term, ‘democratic civilization’. What do these terms mean concretely? I make a distinction between democratic republic, democratic autonomy and democratic confederalism. Democratic republic is the project of reconstructing Turkey, with at its core a new constitution that would separate civil rights from identity. In the current constitution of Turkey, civil rights are dependent on being Turkish and this identity is to a certain degree defined ethnically. Democratic republic is the name for a republic in which civil rights are no longer the privilege of a certain ethnic group; a republic in which demos is separated from ethnos. Democratic autonomy means giving people themselves the power to decide on matters that affect them. Democratic confederalism is an administrative structure of the local bodies, councils, in which this power is organized. I think those are the core elements. Democratic modernity or democratic civilization is, I would say, an umbrella term for these principles. And the goal is to extend democratic confederalist networks across the existing state borders? Yes, the goal is to form democratic autonomy from below, by making decisions from below. Democratic confederalism means such decisions are not taken in isolation of the other and are not limited to local concerns and deliberations. Local autonomy needs to be formed in connection with the other, otherwise you could get a situation in which a community is only interested in itself and basically ignores the rest of the world. In parts of Rojava oil is found. Without such connections, you could get a dynamic in which the community living on top of the oil says ‘this is ours’, and the inequality between regions would be reproduced. But in Öcalan‘s statements one finds very little discussion of such social-economic issues; he focuses on cultural rights and freedoms. He argues that in the Kurdish regions there is no crystallization of social classes and that there is no class struggle there. How realistic is that? There are some sharp contradictions, especially related to land. Cizîrê, the largest of the three cantons in Rojava, consists predominately of agricultural land. If you look at southeast Turkey, north Kurdistan, that is also a predominately agricultural region with only a few normal pockets of industry, similar to Iranian Kurdistan. The exception is southern Kurdistan in Iraq, which is a consumption economy based on the export of oil and the import of almost everything that is needed. Especially in southeast Turkey a middle class is forming and the social contradictions and social struggles are locally, in the cities, the major issues facing the movement. Maybe you can’t really say that there is a working class, because the economy is at such a low level of development, but there is an underclass. And the question is: how does the movement relate to this? In theory, this question is not really addressed. But last year there were a number of meetings in southeast Turkey to discuss how an economy would be organized under democratic autonomy. So the issue does receive some attention but it is easier for the movement to organize people around cultural or linguistic issues. When the Turkish state offers no education in the Kurdish language, you can organize that yourself — and then the state can ban this, but the contradictions are clear. Reorganizing the economy is more complicated. Is this discussion not also made more difficult because inside the movement there is a tendency to speak in terms of Kurds in general against an alien oppression? Because when you want to discuss the social question and, for example, contradictions between landless peasants and landlords, you speak about contradictions between Kurds, inside the Kurdish people, or whatever term you want to use. It is clearly an issue that receives less attention at the moment. The old PKK regarded both social issues and national liberation as central themes around which to organize people. In democratic autonomy, in the current ideology, national liberation no longer takes the shape of forming a state but of self-organization. The social question needs to be a part of that, but in a context of war as in Rojava today, that would look very different from north Kurdistan, for instance. In Rojava, the distribution of energy and foodstuffs is organized by the organs of democratic autonomy. In the social contract of Rojava, land was declared to be under common ownership — but the land of big landlords has not been expropriated because the movement ‘does not want to use force’. Still, if the social contradictions deepen, what is the alternative? At the moment the movement in Rojava is not yet confronted with this issue. Many of the landlords have fled and it is unknown what will happen when the war ends, and if these landlords will return. I think it was a choice of the movement to remain cautious for the moment. The old PKK saw its revolution as a project with two stages: national liberation first, through forming a Kurdish state, and after this social liberation and equality. Does the way in which the social question is less central today still reflect the influence of this sequence? I don’t think so. In principle, the movement sees the two as simultaneous but also as processes that are ongoing. It is the same for the gender issue; the movement doesn’t say ‘first we establish democratic autonomy and take care of cultural and linguistic issues and only after that comes the position of women’. Instead, they work simultaneously on these issues. In Rojava, for example, some families keep their daughters at home and don’t allow them to go to school. The movement doesn’t force these families to send their daughters to school; they talk with them, try to convince them. Liberation doesn’t happen suddenly — it is a continuous process. In the case of these conservative families, it might be counterproductive if the movement tried, in a top-down fashion, to force such cultural habits to change. But it is the same with the issue of land, and of who owns it — that is also a cultural matter. But in the case of land there is a clear contradiction between the interests of big landlords and landless peasants. Force becomes unavoidable. True, but, and I’m speculating here, I don’t think the PKK or PYD would turn against it if a strong peasant movement would arise to expropriate the land. If these landlords return after years and demand their land back, the people who have been cultivating that land will probably not give in easily. I think it is possible that the daily reality brings about a process of expropriation, but that is not certain. All this of speaks a certain conception of revolution, it is no longer like with the old PKK that saw its task as seizing power and then implementing socialism by decree. Instead, revolution is seen as a process of raising consciousness and giving ideological guidance. The PKK nowadays no longer says it is the ‘vanguard party’ but the catalyst and ideological inspiration. So the PKK/PYD does have as a goal to fill these democratic structures with its own ideology. I think so, hence the strong emphasis on ideological education. One of the core elements of that ideology is women’s liberation. But, as you already mentioned, there are also strongly patriarchal traditions in the region. Where does this emphasis on women’s liberation come from? Here again Öcalan played a significant role by raising this issue in the organization. But it did not start with hem. Women played an important role in the early PKK already, maybe they were not many but they had influence. That distinguished the PKK from other left-wing parties at the time that had no women in leadership roles. And the attention for women’s liberation grew. From the beginning, the struggle of the PKK provided a space in which women could play a social and political role and as the influence of the PKK grew, this space also grew. Öcalan’s role was raising women’s liberation as a theoretical issue in the party. At the same time, women in the party use his name. Around 2003, 2004 there was an internal struggle in the PKK after the party-leadership decided the women’s movements should be subordinate to the party. The women’s movement strongly opposed this and they used the arguments of Öcalan, the leader, to strengthen their case. They won this battle. So Öcalan’s statements are also used by the members to struggle for a certain autonomy for themselves. The PKK has a peculiar conception of women’s liberation. They hardly ever refer to feminist thinkers or currents outside of their own organization and tend to think in terms of a dichotomy between men and women – and to prioritize this contradiction over others. True, but this is an attempt to form a certain subject. The contradiction colonizer-colonized is a contradiction that enables the formation of a group, the social question is another, although this one is given less attention now, and the contradiction between men and women, the gender question, is another. There are multiple fields of struggle and the attempt is to formulate a politics that doesn’t prioritize one struggle over the other. But many PKK-texts discuss ‘the woman’, while one of the insights of the feminist movements is that there exists no such thing as a single, homogeneous category of ‘the woman’, women are divided along nationality, sexual identity, class et cetera. I think the women’s struggle is formulated on a highly political and ideological level and takes place along lines that are partly the result of the division of labor between men and women and partly of cultural and religious conceptions about the roles of men and women. Discussions on how to shape that field of struggle are being followed by people who are close to the movement but I don’t know what impact this has within the party. People who are not affiliated to organizations or who are not party-members often play an important role in discussions about left-wing politics and with the PKK as well you can see that people become active around a certain issue and discuss these issues outside the party as well. Does the PKK take an interest in those kinds of discussion? They rely strongly on their own education and ideology. At the same time, when you go around the region and for example look at bookstores that are close to the movement and that sell books that are published locally, you see a broad range of thinkers. Think for example of people like Wallerstein and Chomsky, but also Adorno or Gramsci are translated. What I found interesting was the letter of Suphi Nejat Agirnasli, who was supposedly a member of the Turkish MLKP, and who fell in the defense of Rojava. He referred to a number of Left-wing feminists, something you might not expect from a member of a maoist organization like the MLKP. And recently circles that are close to the PKK organized a large conference in the German city of Hamburg to which they invited different left-wing thinkers like John Holloway and David Harvey. Does the involvement of several left-wing Turkish groups with Rojava lead to changes within the Turkish Left? I don’t know that significance of that, what is more important is the development of the legal Kurdish, left-wing party HDP and to what degree it will succeed in finding support in the west of Turkey. The legal Kurdish parties have always tried to form alliances with the Turkish Left and often entered elections together but these parties remained normal. The HDP is now trying to build a party-structure that can appeal to Left-wing Turks as well and which is broader than the existing, normal radical groups. If they succeed in this, there is a change of a political breakthrough. Rojava drew a lot of attention during the struggle against IS in Kobani. But the experiment in Rojava was made possible by the civil war in Syria. The PYD is accused of making a bargain with the Assad-regime: the regime pulled out its troops, the PYD won’t open a new front against the regime, creating a kind of win-win situation for Assad and the Kurds. But it is also the case that already since 2005 people where working on the idea of democratic autonomy, in Turkey as well such structures are being formed and they are trying to begin the same process in Iran. But in Rojava this project could take on a very different shape, indeed partly because of that war. People work on the same project and are trying to shape that inside the existing relations of force. The civil war in Syria gave an opportunity to develop this project but you can’t say the movement wanted it this way. From the beginning the PYD said it opposed armed struggle against the Assad-regime. The PYD supported peaceful protests but when the armed struggle began and there was a risk the Free Syrian Army or jihadi’s would enter Rojava they rapidly armed themselves. The PYD claims the YPG and YPJ are not party-militia but form the defense forces of Rojava. Other Kurdish groups find that not very credible, they consider these organizations the party-militia of the PYD. It is true these military forces are ideologically closely related to the PYD, but there are also groups inside the YPG-YPJ that aren’t necessarily PYD-members, like the Arab or Christian units. I think it was a wise decision of the PYD to limit the number of militia in the area. And besides the YPG/YPJ there are local units represented in the command structure. These local units defend their own villages but are not mobile, they can not be dispatched to other areas. But there are clearly contradictions between the PYD on the one hand, and on the other hand the Syrian parties that are linked to the Kurdish Democratic Party of Iraqi-Kurdish president Barzani. Similar, but to a somewhat lesser degree, there are tensions with the Patriotic Union of Kurdistan from Iraq. Those parties have a very different conception of power, of the future and the development of Kurdish self-rule. They are much more conservative. There are also sharp contradictions between on the one had the PYD and on the other hand, to simplify things, the Arab opposition. The PYD did not support armed struggle against Assad but this kind of struggle was not an option freely chosen by the opposition, it was self-defense. The PYD is accused of giving benefit to the Assad-regime by not only preventing the formation of a new front, but also by repressing anti-Assad demonstrations inside Rojava. People have been killed by the YPG during protests. How do you see the development of this relation? There is some cooperation on a local level, a number of Arab tribes have joined the struggle of the PYD. But the relationship with the politically organized opposition is much more difficult, even if there is cooperation with parts of the FSA. The jihadi’s have grown very strong in the Arab opposition and their world view is in contradiction with that of the PYD. There are other accusations of Human Rights violations, recently there were claims that the YPG forced out the Arab population of a number of villages under the cover of the struggle against the Islamic State. The PYD stands for a Rojava that is the expression of cultural and ethnic diversity. For example, Efrin is home to many Alevites and the female co-president is Alevite, in Cizîrê there is a large Arab population and one of the co-presidents is Arab. You see the same on a local level. A major difference between the PYD and the Syrian allies of the KDP is their attitude towards the Arab population in Rojava. The KDP-current says; those people have been brought here as part of an Arabization policy of the Baath-regime and they need to leave, even if they have been here for generations. The PYD says that everybody who now lives in Rojava should be involved in building a new society. The defense of Kobani was a success, partly as a result of aid by Western powers, foremost the air attacks by the US. Some critics say the PYD has become a tool of the West, how would you respond to that claim? That kind of criticism comes from the attempt to stay ideologically pure. It is more difficult to remain pure once you involved in the struggle. If you are involved, you have to navigate a field determined by relations of forces that you did not select, and you have to make choices inside that field. There were no real options except pressuring the US to bomb IS. And that was done in a very clever way. The US was not eager to intervene, shortly before the bombings the White House still declared that Kobani was ‘not a strategic asset’. That they started bombing, and increasingly intensive, is because the PYD made the defense of Kobani in a certain sense a strategic issue; if the city had fallen, that would have been an immense moral blow that would have affected the US as well and IS would have been strengthened. You could almost say the Kurds have forced the West to get involved there. There were few other options, one of the defenders of Kobani tweeted that if the international Left had had an air-force, they would have asked that one for help. But even if you recognize the PYD had no other options, you can ask whether, against its own will, it has not become dependent on the US. But I don’t see this dependence. Maybe there have been agreements that I don’t know anything about, but the PYD has not only maintained itself, its position is now stronger than before. Kobani has become a symbol of their success. But it is likely the US will turn against the Rojava project if for example the PYD insists on the principle that resources like oil should be common property. That is likely, but you can question how much influence the US will have in the region in the future. Since 2003 and the invasion of Iraq the influence of the US has been dwindling there. Local powers like Turkey, Qatar and Saudi Arabia play a much more important in the local developments than before. The US is still a factor but is no longer as powerful as before. Especially Turkey is at the moment an enemy of the Kurdish movement. Turkey is doing everything it can to marginalize the PKK and the PYD, without success. But the relationship of Turkey to the governing parties in south-Kurdistan, north-Iraq, is very different. They had a good relationship for a long time but those ties were recently damaged. When the city of Erbil in north-Iraq was in danger of being taken by IS, Barzani asked Turkey for help but got the cold shoulder. The PYD claims the Turkish state actively supports groups like IS and Jabhat al-Nusra. How credible are those accusations? I think there are reasons enough to believe those. There are many indications that Turkey is giving direct and indirect support to jihadist groups. For example, there are recordings that show Turkish soldiers interacting with fighters along the border of areas controlled by jihadi’s. The Turkish secret service MIT has been involved in delivering arms. There are many such examples. Recently it became known that the Turkish army had given artillery support to jihadi’s when they attacked an Armenian village in northern Syria, Kassab. Leaders of jihadist groups can meet without any problems in Ankara, jihadi’s have been taken care of in Turkish hospitals, you could go on. Is this organized by what is called the ‘deep state’ in Turkey or is it government policy? I think this is discussed and decided on a government level. Turkey’s foreign policy under the AKP government, so-called neo-Ottomanism, is based on Sunni-identity politics, on supporting Sunnite movements in Syria and Iraq. Qatar and Saudi-Arabia are also trying to gain influence through Sunni-movements, just like Morsi tried to do when he was president of Egypt. Turkey has tried, without success, to repress the PYD by supporting Sunni-groups that are hostile to it. This policy means the Turkish state is playing with fire by supporting jihadist groups. IS has already threatened on several occasions to attack Turkey if its government changes its attitude. Many IS-fighters have a Turkish background and they might in the future become a risk in Turkey itself, all the more because support for IS has grown inside Turkey. A few weeks ago the Assad-regime declared to have no objections against Kurdish flags, a symbolic break with the Arab nationalist Baath-ideology. Is that a taste of the future, of a autonomous Kurdish region inside Syria? Kurdish autonomy is already a reality, and even if the Assad-regime would decide to turn against it, I doubt it would make much of a difference. The last few weeks there have been some quite intense clashes between the YPG and the Syrian government army. Is there a chance this could lead to a real war between the two? That is difficult to say but Assad has no interest in such a war, his regime is already weakened. Assad’s interest is in an agreement and the PYD also has nothing to gain from such a confrontation, they have their hands full fighting IS and al-Nusra. But the current situation is volatile and won’t remain the same for long. Alex de Jong is editor of the socialist journal Grenzeloos and an activist in the Netherlands. This interview originally appeared on Actie voor Rojava. Note: Alex de Jong's piece that is related to ideological development of PKK can be found in libcom. Inside the PKK, the criticism of the Turkish nation state led to questioning the desirability of a Kurdish nation state in which minorities might yet again be disadvantaged. The state as such is criticized by posing that it...has supplanted people’s...potential for self-organization. This is almost willful manipulation of the position of some who count themselves as revolutionary socialists--and are also fighting in Syria. If we can acknowledge that the Syrian Revolution is still ongoing, than we can see quite easily why these air strikes are harmful to it. Any strike could potentially hit revolutionary militants who are outside of YPG-held territory. But let's say that for the sake of argument that the Revolution isn't just experiencing an ebb but has been snuffed out of existence. These air strikes would regardless still pose a dangerous threat to the stability of Rojava. Rojava is not just Kurdish--it has Arabs, Assyrians, Armenians, Turkmens, Alawites, Christians, among others. Moreover, Rojava is not simply a place holder for the PYD, there are still other political forces which are smaller and may even exist below the media radar. They too, are part of this movement, and they too are probably also majority Kurdish and believe in self-determination for the Kurds in all parts of Kurdistan. But let's just say for argument's sake that the Syrian Revolution beyond Rojava is non-existent--at all. What benefit would these air strikes give to Rojava, let alone Kobane? For one, they would immediately isolate the revolution in Rojava from the rest of Syria, which now must suffer not only Assad's bombing and attacks from ISIS, but the Coalition as well. Moreover, these bombs were not only falling on ISIS targets. In fact, they've been falling on Syrian workers. They were falling on the Arab population. They were falling on civilian infrastructure such as grain silos, farm equipment, and even oil refineries. They have been falling in ISIS-held territory as well as in the more contested regions. If air strikes are being demanded, then air strikes is what will happen--indiscriminately and without consideration or consultation of the PYD. Because U.S. imperialism could care less if Kobane falls--in fact it's stated its priority as propping up the crumbling Iraqi regime--it will bomb targets that are of immediate interest to its own. Civilian targets which are being held captive by ISIS are and will continue to be hit. That's how it works and that's how it has been working in Syria. In this situation, for solidarity groups to pledging unconditional support to all of the demands made to defend Rojava will surely be blindsided by high-altitude bombing and laser-guided missiles when they land on unintended targets. To put it bluntly: do supporters of Rojava support the bombing of Syrian civilians? As far as I could work out, part of the problem is that ISIS has tanks and other heavy weaponry abandoned by the retreating Iraqi army that made it impossible to defend Kobani without aid from the Iraqi Peshmerga (who have access to anti-tank weapons) and coalition airstrikes. But I agree with you that there is a problem with the airstrikes due to their indiscriminate nature in attacking civilians and Jihadis alike. The only problem is that while an end to the airstrikes would result in less civilian deaths, it would also inflict greater casualties on the YPJ/G, leading to the horrible choice between civilian vs military priority. Perhaps the single-best military analysis on that round between the YPG-IS. Worth a look, addresses the question of IS's military capability (that is to say, not much).